As if you needed an excuse to eat oranges and lemons, March 31st is National Oranges and Lemons Day. Oranges originated around 2500 B.C. somewhere in Asia. In ancient Europe, oranges were grown largely for medicinal purposes. As you already know, Vitamin C is still deemed an excellent cold remedy to this day. Did you know that lemons are actually a cross between the citron and the sour orange? Christopher Columbus is credited for bringing lemon and orange seeds on his journeys, consequently introducing them throughout the New World. Today, both lemons and oranges, grow exceptionally well in California and Florida. Both fruits grow quite nicely in Arizona. Oranges are more seasonal here, doing well in the winter and early spring months, and lemons can do well year round. To celebrate these esteemed fruits, let’s take a look at some little known facts about each. Oranges are a delicious, juicy, sweet-sour citrus fruit. There are actually around 600 varieties of oranges, some of the most popular being Blood Oranges, Navel, and Valencia. Oranges are unknown in the wild. The orange is a hybrid of the mandarin and pomelo. Orange juice is the most popular juice in America, and the orange itself is the fourth most popular fruit. Brazil grows approximately 1/3rd of the world’s oranges, with the production of 17.8 million tons per year. About 85% of all oranges produced are used for juice. You can sprinkle orange peel over a vegetable garden as an effective slug repellent. During the years of world exploration, sailors planted orange trees along their trade routes to prevent scurvy. A disease that develops from a deficiency of vitamin C.
Orange is the world’s third favorite flavor, coming in behind chocolate and vanilla. Warm weather can cause the skin of an orange to reabsorb chlorophyll, causing it to re-green. Don’t let this stop you from eating them though, they still have that same great taste. Oranges are high in anti-oxidants. Anti-oxidants neutralize the effects of free radicals in your body, which are believed to cause diseases and aging. So eat an orange to stay young and healthy! Just one orange, contains enough vitamin C for two day’s supply. The fruit came before the color. It wasn’t until 1542 that “orange” was first used as the name for a color. The more bitter varieties of oranges are used to make marmalade. Navel oranges get their name from the belly-button like formation on the opposite end of the fruit’s stem. A bigger navel makes for a sweeter orange. You can store oranges either in the refrigerator or at room temperature. They last about two weeks regardless of which storage method you choose. It is better to store oranges loose rather than wrapped in a plastic bag as they develop mold when exposed to moisture. Lemon trees will produce fruit year-round. One tree can produce 500 to 600 pounds of lemons in a single year. The most common varieties of lemon include Eureka, Lisbon, and Meyer. Lemon juice contains about 5-6% citric acid, giving them their sour taste. Arizona and California produce 95% of the entire U.S. lemon crop. Years ago, kings would present lemons to one another as they were once very rare. Add the juice of one lemon to an equal amount of hot water for an anti-bacterial gargle the next time you have a sore throat. The grated outer rind, or lemon zest, is used for flavor in many baking recipes and other dishes. The leaves of a lemon tree can be used to make tea and in the preparation of cooked meats. Lemon can be used for cleaning due to its high acidic nature. Lemon halves dipped baking powder or salt can be used to clean kitchenware and brighten up copper. Cattle will choose lemon over grapefruit, peaches, oranges, and even apples. Most likely because the citric acid in lemons aid in their digestion. Lemon juice has a low pH which makes it a good disinfectant. It can also break up grease and oil and does away with bad odors. Lemon oils are regularly used in non-toxic pesticides. Lemon juice is often used to preserve foods that have a tendency to turn brown, like avocado, apples, or bananas. Drink warm water with a squeeze of lemon before breakfast to relieve constipation. One lemon can provide 50% of a day’s requirements of vitamin C.
Refrigerate lemons in a plastic bag after sprinkling them with water to keep them tasting fresh. When frozen, lemons can last a month or longer. Temperature changes turn lemons from green to yellow, not ripeness, so green patches are OK, but it’s best to avoid those with brown spots, which indicate rot. As you see, lemon has a lot more use than that pitcher of lemon aid! 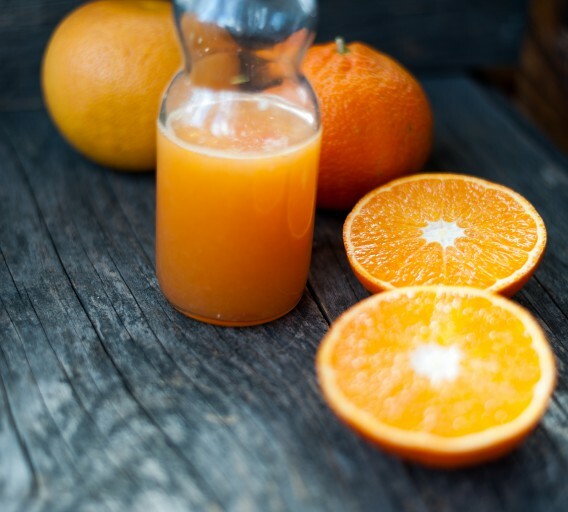 And, though orange juice is our most popular juice, oranges can be made into so much more! To celebrate their special day, take a look at some of the lemon and orange recipes we have collected, you may discover a new orange or lemon recipe favorite. This entry was posted in Food Facts, Fruit, Produce and tagged Arizona, Arizona farmers, Arizona produce in season, Fill Your Plate, Fruit, Home, local food. Bookmark the permalink.